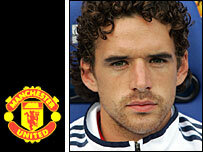 Owen Hargreaves could hand in a transfer request if Bayern Munich continue to block his desired move to Manchester United. The 25-year-old has made it clear he wants to move to Old Trafford and handing in a transfer request may be the only option open to Hargreaves. Bayern are determined to keep him and have threatened to report United to Fifa for breaching transfer rules. The England international's contract with Bayern runs until 2010. Hargreaves was left out of the Bayern team which played Bochum last weekend and did not travel to Spain when the German club played Barcelona in a friendly game. Bayern are particularly keen for him to honour his contract after losing Michael Ballack to Chelsea over the summer. United are thought to be prepared to offer up to £17m for Hargreaves, whose stock rose with some impressive performances at the World Cup. But Bayern general manager Uli Hoeness said: "Bayern Munich will never be taken for a ride and become weak at the knees as soon as a certain level of money is mentioned."